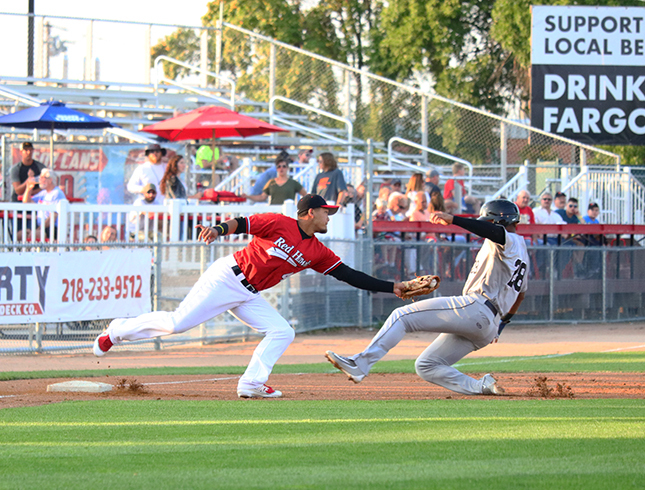 FARGO, N.D. — A 12-run ninth inning for the Sioux City Explorers blew a previously close game open as the RedHawks fell 19-5 at the hands of their South Division visitors tonight at Newman Outdoor Field. The RedHawks had narrowed Sioux City’s lead to 7-5 with a run in the bottom of the eighth and look poised to mount a comeback bid after falling behind by six runs earlier in the game, but the Explorers hopped all over RedHawks relievers Travis Ballew and Francisco Gracesqui for 11 runs on six hits to take the air out of Newman Outdoor Field. Will Solomon earned his seventh loss of the season after giving up six runs on nine hits over five innings after being named American Association Pitcher of the Week last week. Solomon drops to 9-7 on the year with a 4.37 ERA. Maikol Gonzalez finished as the only RedHawks batter with multiple hits in tonight’s game. The second baseman had an RBI double in the sixth inning. Fargo-Moorhead will try to bounce back and win the three-game series with the Xs tomorrow night at Newman Outdoor Field. First pitch is scheduled for 7:02 PM.